Shoulder Arms - 100th Anniversary! This film is a part of a Double Feature with Dr. Strangelove. When two movies that are screening in the same theatre are grouped under the same thematic heading, one ticket is good for both features when viewed back-to-back on the same day (except as noted). Charlie Chaplin, Edna Purviance, and Sydney Chaplin. Though only 37 minutes in length, this wartime comedy is considered to be Charlie Chaplin’s feature-length directorial debut. 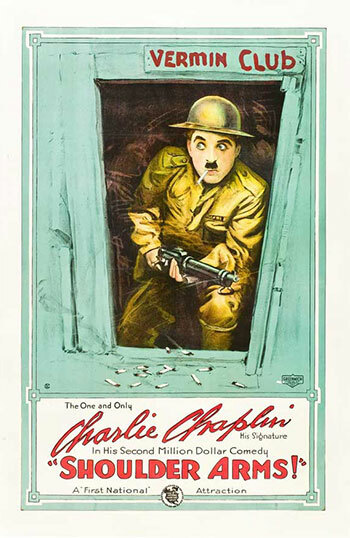 Bringing some much-needed levity to weary audiences around the world, this story of a bumbling soldier became, at the time, Chaplin’s most popular movie. Don’t miss this rare opportunity to see a 100-year-old classic on glorious 35mm film!